by Mr. Sandburg, from Death al Dente, first in the Food Lovers' Village Mysteries, by Leslie Budewitz, new this August! Sandburg & Erin are giving away a copy of Death al Dente -- leave a comment to be entered -- winner will be chosen Wednesday evening! I’ll admit, I wasn’t so sure of this big move my girl Erin took us on. I was a City Cat. Loved it. My original owner, Roxy Turner, was a marvelous old lady who read me poetry and fed me tuna. Her apartment in Seattle overlooked a park with a reservoir where she often went walking, while I sat in the window keeping an eye on her. That’s where she met Erin. Nice girl. 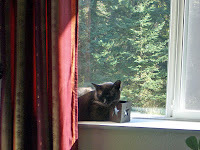 Visited Roxy often, and fed me when Roxy was in the hospital. Then Roxy died. Her kids – all nice enough – had their own families and pets, so they asked Erin to take me. She did, and I moved to her apartment. Which was Really Small, and did not have a window overlooking the park. Then she put me in a crate in her car and drove and drove and drove. And here we were: our cabin in the woods. Took me some getting used to, I’ll tell you that for nothing. But you know what? There are mice in the woods. Mice to chase, and if I’m lucky, catch. (And no, I’m not a catch-and-release kind of guy. I kill to eat. But don’t tell Erin. Although I bet she’s figured it out – sharp one, that girl.) 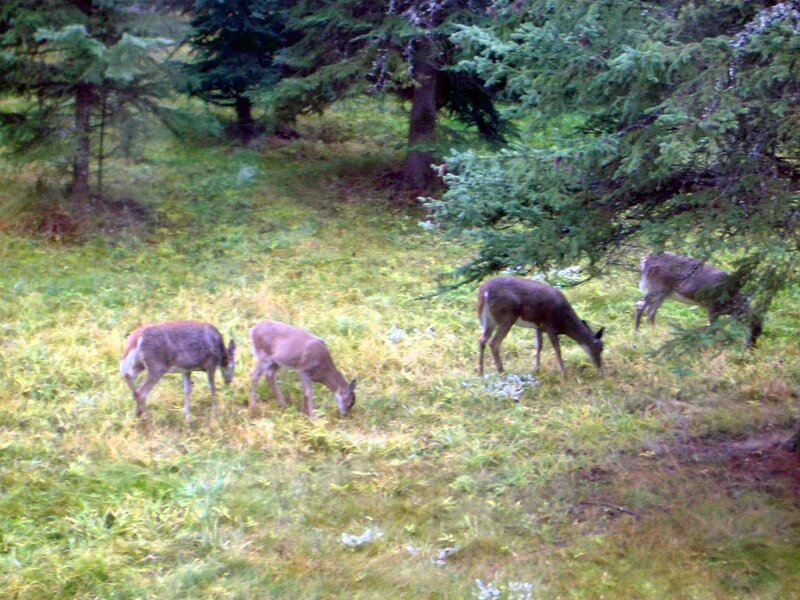 And deer to tease. Even bears! Places to run and play, and places to lie in the sun where no one can see me. I guess that makes me a country cat, doesn't it? Do you have a favorite place in the woods? 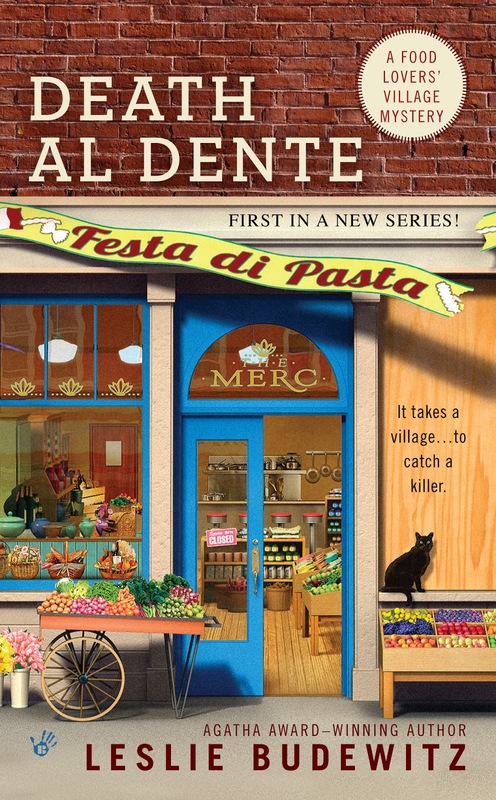 Tell me in the comments and I'll paw -- or draw -- the winner of a copy of Death al Dente Wednesday evening! We love everything about the woods. Except leashes. I like that there are woods behind my house rather than houses. So glad to find out more about Mr Sandburg - I wondered what his life was like before he came to live with Erin. 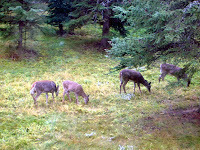 I love sit and watch the wild life off of my deck especially on the cool spring and fall evenings. Sandburg, as much as you have adjusted to the great out of doors, I wish you'd stick to looking at it through a window. Outside is not a safe place for cats. 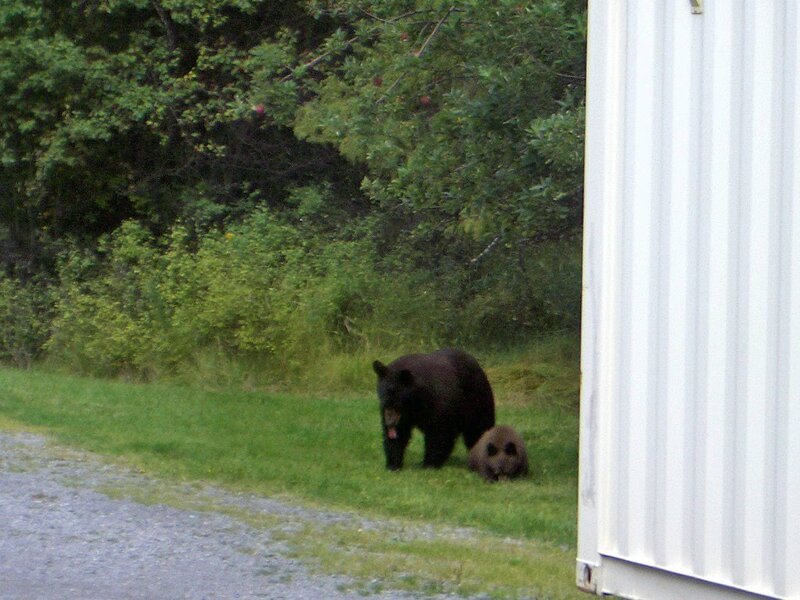 Those bears could make a snack out of you. Libby, a mee-ow of thanks for your concern. But a guy's gotta do what a guy's gotta do, ya know? Besides, our bears are vegetarians. Fruititarians, to be precise. Fine with me -- huckleberries, service berries, thimble berries, they can have 'em! Sally and Tally, you seem like nice dogs, and I'm sorry about the leashes. Erin's mother Fresca has a dog, Pepe the Scottie, and sometimes she has to go on a leash, like when they come into town. But not in the woods! Fresh squirrel and mouse are mighty tasty! But my fur gets dirty when I'm outside and dried leaves cling to it. Blech. I think you have the best of both worlds, Mr. Sandburg. Count yourself lucky! We used to have a patch of tall evergreens that we'd ride horses through. The wind through the needles had a peculiar whistling sound. It was lovely. Several years ago that wind got carried away and blew them all down in a bad storm. That was disappointing. When I was a kid we used to go to my Aunt's house a lot. My cousin had a tree house in the woods behind their house. When I was small my grandparents lived on 40 acreas in Northern Minnesota. I loved to walk by myself on the old road that lead to the lake. I wouldnt go far, just far enough to pick wild Raspberries and listen to all the birds singing. I don't have a favorite spot in the woods, but do love Western Montana and have had my eyes on this book. Sounds like a great one! I love the woods- but being in Arizona- I dont see much of them! Twinkletoes, I assure you, I am one happy guy! Sounds like you are, too! Julie, so sad about your trees. That wind does get full of itself sometimes, doesn't it? Blew a fir across the driveway last weekend and Bob -- you may not know him yet -- had to get out the chainsaw, which sends me under the covers. Sandy, my girl Erin still visits her childhood treehouse in her mother's orchard. Sweet! Anon, that sounds heavenly! Although you can keep the raspberries. Kristin, what good taste you have! Samantha, no woods? My condolences. Come visit us on the page and get your fill. hI, i JUST LIKE TO WALK IN THE WOODS IT IS SO QUILT AWAY FROM THE CARS AND TRUCK. I don't have a favorite place in the woods. I don't get out there often enough. I am an outdoor indoor kinda guy. Mom lets me come and go as I please. We live in the country and I keep the mouse population in check for her. Ah, Fiona, you are so right! How lucky we are to have it both ways -- time to play outside, and time to cuddle up with our people! Would you believe, I got a captcha when I left this comment, and the first three letters were CAT? It's a sign! Lovely to look at, but the woods are definitely not my thing! Oh, you all paint such lovely images of your woods -- more than I can comment on, since I need Erin to type for me. (Drat the lack of thumbs!) So glad you know the peace and joy of a special place in the woods. I have mine, and Erin has hers. Come visit and let us show you around! Living in the city, don't get much chance to see the woods. Have taken a little trip and stayed in cabins in the woods and enjoyed that a lot. Going through the trails and looking out for wild animals, mostly seen skunks and ran away. LOL It is peaceful and truly enjoy getting away from the city. Skunks! I heard Erin and Fresca laughing once about the time their old Border Collie, Sparky, tangled with a skunk, and while I love those women and I never knew Sparky, I could not understand what they thought was so funny. Still gives me the shakes. Glacier park is on my bucket list. I try to soak up green trees while traveling. Living in SoCal and near desert there is too much brown. Ah, Glacier. I have heard tell of its wonders, but Erin doesn't take me sight-seeing. Thanks to you all for a lovely conversation!